Elaine Lustig Cohen made her living as a freelance designer in the 1950s and 1960s—during a time when few women worked in the field. The 87-year-old New York-based designer said men in the industry barely noticed her and never saw her as competition. Aaris Sherin ’03 (graphic design) recaptures Cohen’s tenacious spirit and multifaceted talent—ranging from book covers and advertising brochures, to paintings, drawings and collages—in her new book, Elaine Lustig Cohen: Modernism Reimagined, published by RIT Press, the scholarly publishing enterprise at Rochester Institute of Technology. While studying at RIT, Sherin became introduced to the designer’s artistry through a collection of her work that was donated to the RIT Graphic Design Archive in 2008. The book provides a critical overview of Cohen’s career based on Sherin’s interview sessions with the artist, along with full color examples of her work—paying particular attention to book covers she designed for Meridian Books and New Directions. According to Sherin, Cohen’s first challenge came when her husband, designer Alvin Lustig, died at age 40 leaving her a 28-year-old widow with little means. They had worked together but she had never been considered a designer. Undaunted, she began by completing the projects Alvin left unfinished and then went on to continue working for many of the same clients. She later married Meridian Publisher Arthur Cohen who continued to support her work until his death in 1986. Sherin is an educator, writer and designer. She is an associate professor of graphic design at St. John’s University in Queens, N.Y., and author of several books including Sustainable Thinking: Ethical Approaches to Design and Design Management (Fairchild Books 2013). This is the fifth book in the RIT Graphic Design Archives Chapbook Series. During the closing RIT exhibition “Elaine Lustig Cohen: Voice and Vision” on Sept. 18, the public is invited to an author’s book talk from 12:30 to 1:45 p.m., gallery talk with Kari Horowicz, curator of RIT Graphic Design Archive, and author booksigning from 4:30 to 6 p.m. The event will be held at RIT’s Cary Graphic Arts Collection, 2nd Floor, The Wallace Center. Refreshments will be served. 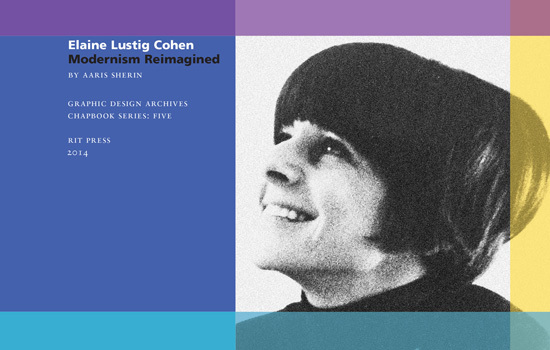 Elaine Lustig Cohen: Modernism Reimagined is available in softcover for $21.95 at http://ritpress.rit.edu or by calling RIT Press at 585-475-6766.